"The Final Days of Superman" - Part 3: "Dazed and Confused"
Superman breaks into a DEO facility in National City and "rescues" his cousin Kara. Turns out she didn't need saving at all. Kara went through some weird things after Superman lost his powers and finally lost hers as well. She was found by DEO agent Cameron Chase and went to the facility voluntarily. Kara wants to go back and sort things out but Superman suddenly weakens and Kara has to help her cousin. Superman tells her that pretty soon there will only be one survivor of Krypton on Earth and that person will be Kara. Meanwhile Doctor Omen gets the blood sample that one of her dragons secured earlier. In Metropolis the man that believes he's Clark Kent heads to the Daily Planet. After killing several staffers Lois is able to incapacitate the man which allows Perry to contact Argus. At the Fortress of Solitude Superman tells Kara what is happening to him and what role she will play after he's gone. Kara isn't sure she should be so public after everything that happened to Superman. He assures her that people have a right to be scared but in the end that they have use their powers to help people. Superman tells his cousin that she is much stronger than she gives herself credit for and while their family shield can certainly be a target it is also a badge of honor. No matter what he will always be there for her. He asks Kara if he can count on her and she tells him she can. As they leave the Fortress Wonder Woman arrives and asks when Superman was going to tell her about his condition. 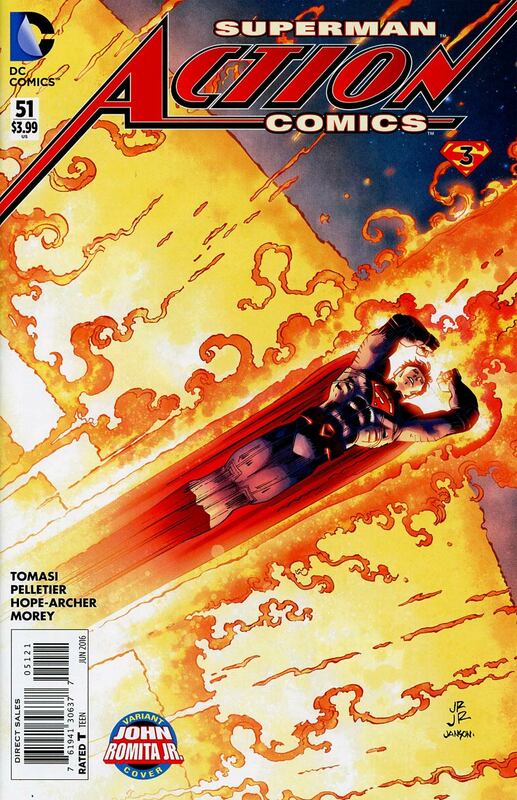 Story - 5: From the beginning of the New 52 there has been this manic-depressive quality to the Superman books. One minute they're fantastic and action packed and telling really good Superman stories and the next they are second guessing the character and turn into a muddled, mangled mess. It's makes me more than a little sad that right here at the end Peter Tomasi starts to turn that frown upside down and makes not only this title but the Superman books as a whole exciting again. The cover to this issue promised The Search For Supergirl, which led me to believe that this was going to be a long process. It was a pleasant surprise that that search took all of three pages. I've missed Supergirl in the comics. Sure we have been getting an amazing television series this season but Supergirl was the one book that never let me down through the course of the New 52 and it was a shame that they didn't do anything with her after her series ended. Superman could have been a little more diplomatic in how he supposedly freed his cousin from captivity and his actions do little to quash the feeling that he might be a danger and that people might be afraid of him but his heart was in the right place. Kara's reaction to being "saved" was on point and I liked that Tomasi filled us in on where she's been during the past few months. She had every right to be mad at Superman and the idea that the symbol made her a target was an interesting angle to play with her being under the radar all this time. The scene in the Fortress was especially touching. Superman is asking a lot of Kara and does a good job of explaining why they do what they do without coming across as patronizing. Superman believes in his cousin and in the end she starts to believe in herself. It could be argued that this is all set up for her new series but Tomasi never makes it feel like that. The subplots with the ex-con that thinks he's Superman and Doctor Omen are coming along nicely. They did not feel intrusive on the issue and I like that there are these other stories playing out while Superman is doing his thing. They were a bit violent but that's the world we've been living in since...well, the eighties. I know some of us like to think that the hyper-violence and limbs getting hacked off are more modern tropes in comics and while they may be a tad more extreme they have also been in mainstream super-hero books for a few decades now so if I complain about it here I have to complain about it in older stories too. Again, it makes me a little more than sad that I am finally getting the Superman I've wanted all along right here at the end before he dies. This is an interesting take on the idea of a "Death of Superman" story. Instead of having an all-out battle with Doomsday and then dealing with the ramifications of what Superman's death means to the world we are seeing that all before the big event. I am not saying one is better than the other because I love the Death and Return of Superman saga but I don't want to see a shot for shot remake of that. Tomasi is giving us an emotional story where a man that feels it is his place to protect everyone has to deal with the fact that he's dying. The two stories play with similar themes but in very different ways. I think it is a shame we're losing this version of Superman because at no time did I blame the character for what was being done to him. For the past six months or so I have let the Superman books I don't review pile up. This story has changed all of that. I can't wait for the next chapter. Art - 5: The art in this issue was amazing. Paul Pelletier's work is very different from what it was back in the nineties in all the right ways. Superman looks great. Pelletier makes the three dimensional S thing work and for the first time in a long time Superman looks heroic. He also makes Supergirl's costume work and it's a testament to his story telling skills that the scene in the Fortress worked so well even though it was ostensibly two people talking. The sequence with Doctor Omen was visually stunning as well as the scene in the Daily Planet. Wonder Woman looked fantastic as well. Over the past year or so I have either preferred either the writing or the art but with this issue I loved them both. Cover Art - 4: This is a simple cover but it's not boring. 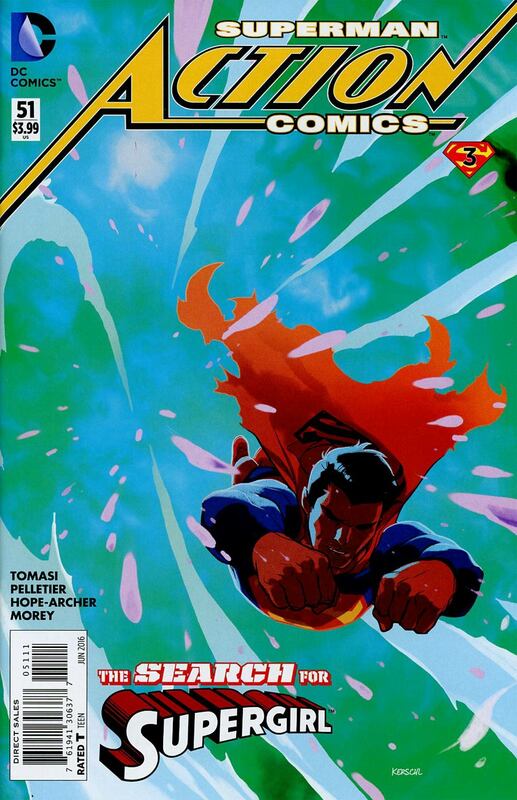 The color scheme is a little odd but Superman looks good and after a few months of pretty awful covers this one was a breath of fresh air. Variant Cover Art - 3: This isn't a bad cover but it really doesn't appeal to me. Superman looks good but I am confused as to why John Romita, Jr. gets a month worth of variants. Nothing against him as an artist and he is certainly talented (most of the time) but I don't get this series of covers at all.